Examination of any classical artworks demonstrates that in the arm anatomical definition is synonymous with beauty. A toned skin envelope allowing sight of underlying muscles is regarded as youthful and attractive. Many patients seek to get rid of their ‘bingo wings’. Patients seek arm tightening either because of the effects of the ageing process or because of significant weight loss. 1. 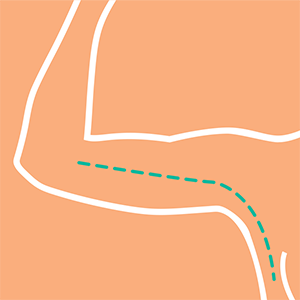 Patients with modest skin droop can be treated with an arm lift procedure leaving a scar around the armpit. 2. 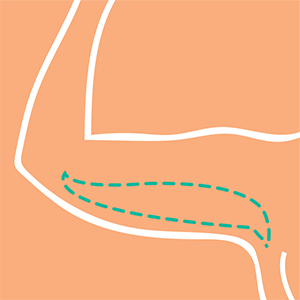 Patients with moderate skin excess can be treated by a standard excision of a skin ellipse extending down the inside of the arm. This may be modified to a "fish" pattern if a lift is considered desirable. 3. In individuals with extensive skin laxity also involving the lateral chest wall, consideration is given to extending the reduction to tighten the skin on the side of the chest. Liposuction is frequently used as an adjunct to arm reduction to reduce the fat prior to skin excision. This helps to preserve underlying fine structures. Minimising risk in arm reduction procedures starts well before surgery with a careful assessment of your general health. Particular attention to nutritional status is critical, especially in patients who have had a gastric bypass procedure. Blood tests are done to assess general health and nutrition. Multivitamins are routinely recommended but in some circumstances targeted nutritional supplements maybe required. Arm reduction procedures do have a higher incidence of complications such as wound opening, delayed healing, bleeding and infection. Careful preoperative evaluation and risk reduction strategies are essential. Wound care post-operatively will include regular check-ups. The incidence of wounds opening a little is around 3%. After healing we recommend applying tape to the scar to minimise scar thickening and stretch. All surgery incurs an element of risk such as bleeding, bruising, swelling and infection, pain and numbness Specific to liposuction there is a small risk of irregularity of contour, numbness, asymmetry and an imperfect result. The risks of complications affecting your general health such as blood clots in your veins (DVT) or chest infection are minimised by careful risk assessment and precautionary measures. Will I be happy with the result? With all cosmetic procedures there is a small risk of dissatisfaction with the outcome. Arm reduction cannot restore normal skin elasticity but can remove some excess. We aim to minimise this by carefully evaluating why you want surgery, what you want from surgery and why you are having surgery now. If you would like to learn more about this procedure, simply provide your details in the form below and we'll send you a downloadable PDF with more information. By ticking this box you agree to receive additional information via email and sign up to our email database.